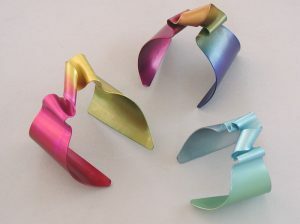 Anodized aluminum cuffs are available in vibrant colors in a variety of unique designs. Fade-dyed adjustable cuff 5/8” wide. Shown in Sahara & Granada. 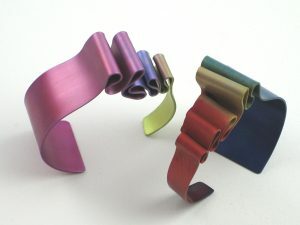 Sculptural cuff fade-dyed, 2 ½” widest – ¾” narrowest. Shown in Bright (top), Memphis, & Ocean. 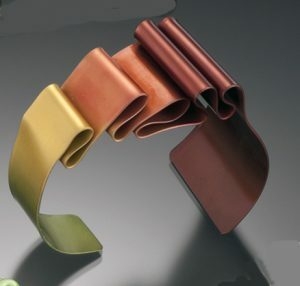 Fade-dyed adjustable cuff. 5/8″ – 1 1/2″ wide. Shown in Rainbow & Cool. 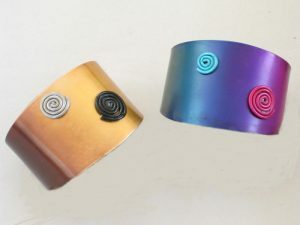 Fade-dyed anodized cuff with wire appliqués that are adjustable. 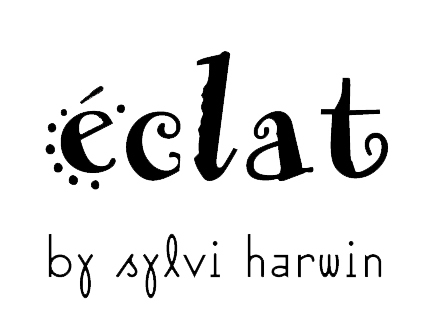 Shown in Basic & Cool. Shown in Rainbow (top) & Cool. 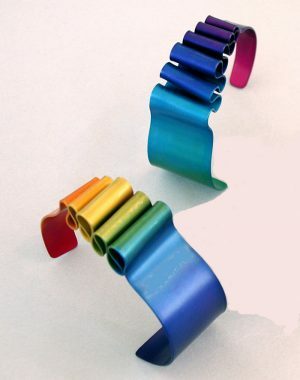 1/4″ – 1 1/4″' wide , fade-dyed with a contrasting wire swirl, fits up to an 8″ wrist. 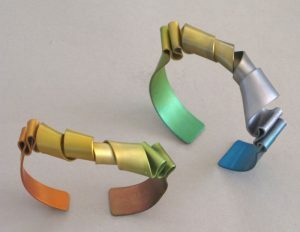 Shown in bronze/gold & Krakatoa. 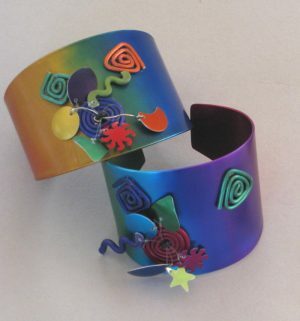 Fade-dyed cuff 5/8″ – 1 1/4″ wide. Shown in Sahara. 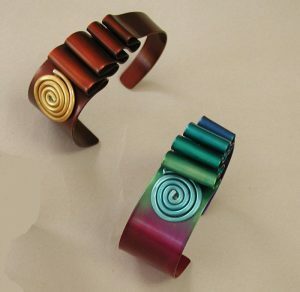 Fade-dyed adjustable cuff ½” – 1 ¼” wide. Fits up to 8″ wrist. Shown in Hanalei (left) & Primary.